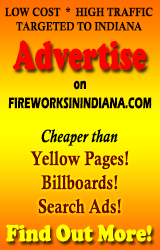 The La Porte Jaycees Fireworks will be held at the La Porte County Fairgrounds this year. Parade on July 4. Local Heroes Benefit event for First Responders. Craft Beer/wine Tasting for 21+ from 3-6. Live music by rising stars from Nashville from 5-9. ($30-$70). Community fireworks gates open at 7. Kids games and food vendors.